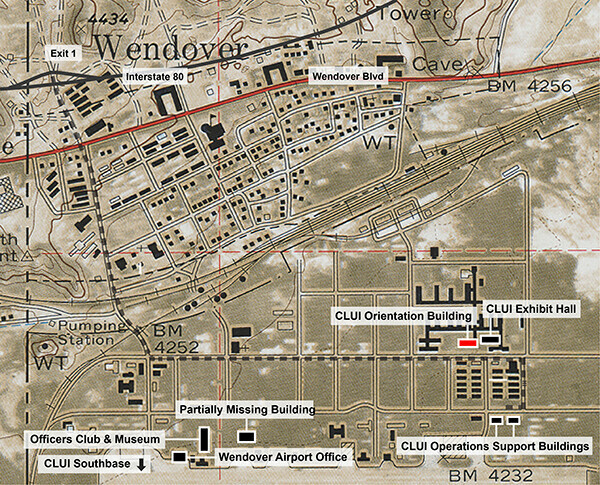 A number of buildings, artifacts, objects, and displays are open to the public at the Center’s complex in Wendover, Utah. Visitors are encouraged to begin at the CLUI Wendover Orientation Building, which has displays about the region. The Orientation Building is open every day. Access instructions are posted outside, and are also available by calling the CLUI at 310 839-5722. Next door to the Orientation Building is the Exhibit Hall. Also open is a display in the Partially Missing Building. Other facilities, including the workshop, studio, and Southbase, are only accessible by prior arrangement, escorted by CLUI personnel. The public is also encouraged to visit displays at the historic museum and airport office. These sites are indicated on the clickable map above, which we encourage you to print out and take with you if you do not have a means of accessing the web while you are there. (Information on accessing the Partially Missing Building should also be printed out prior to your trip if you are without web access on site). Wendover, Utah is located on Interstate 80, on the state line between Utah and Nevada, 2304 miles west of the George Washington Bridge in New York City, and 611 miles east of the Bay Bridge in San Francisco. At Wendover, exit south off Interstate 80 to Wendover Boulevard (the main street in Wendover, which runs parallel to and south of Interstate 80). At the Shell gas station, located on the Utah side of the state line, take 1st Street south, then the first left after crossing the railroad tracks. After about a mile you will see the Orientation Building on the left.